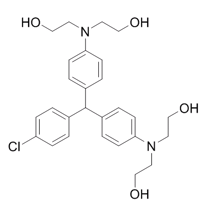 Akt-I-1,2 is a selective Akt1 and Akt2 inhibitor. BAY1125976 is a selective allosteric Akt1/2 inhibitor; inhibits Akt1 and Akt2 activity with IC50 values of 5.2 nM and 18 nM at 10 μM ATP, respectively. Uprosertib hydrochloride is a potent and selective pan-Akt inhibitor with IC50 values of 180/328/38 nM for Akt1/Akt2/Akt3, respectively. Uprosertib is a potent and selective pan-Akt inhibitor with IC50 values of 180/328/38 nM for Akt1/Akt2/Akt3, respectively. NSC177233 is a potent Akt inhibitor, which induces GSK3-dependent, β-TrCP- and FBXW7-mediated Mcl-1 degradation, resulting in induction of apoptosis .